Here is a second lace. One new skill is needed for this lace—a left leaning decrease—called a SSK—if you don't know how to do this, check with your favorite reference book or on line. 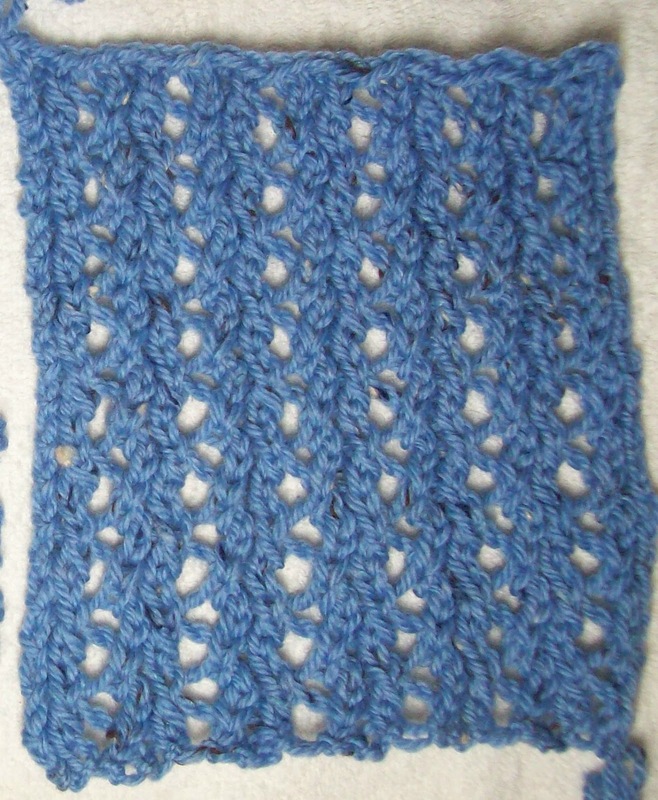 The pattern is a 4 stitch repeat, with 3 additional stitches an edge—So 24 stitches (a multiple of 4) Plus 3 more—a total of 27 stitches for this swatch/example. This vertical lace pulls in (as ribbing does). I used a single yarn cast on (the double knotted one)--I think this lace looks better with a lighter, stretchier cast on—and that a long tail cast on is too thick and heavy. But that is my opinion. Use any cast on you want. Foundation: P1 *K1, P3(repeat) end with, K1, P1. This second lace is a Faggoted Rib--Faggoting is the name for the zig zag lace element bits--a very vertical pattern. It's also a bit harder—since pattern uses 2 different decreases. But it is still a very simple lace. It's is also very stable. It doesn't curl, and it doesn't bias. It's very stretch—I've used it on fingerless gloves and socks. I think it looks better(different) stretched out –If I were to use it on a scarf, I would plan on a hard (very stretched out) blocking. This lace pattern is also often used on baby clothing. Many years ago, my mother-in-law knit me a small layette—a hat, a kimono, and bootees using this lace pattern. 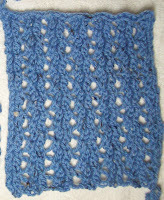 The kimono was very similar to EZ's February baby sweater, but used this lace, and was longer. The hat and bootees were knit flat and seamed. So make a swatch, or two, and take on lace! There are lots of other lace patterns just as simple as these two lace patterns for you to learn. Sure, there are harder laces, more complex pattern, with longer repeats, with un-balanced patterns (that is, the number of stitches in a row will change) or 2 sided patterns--(with YO and decreases on the WS as well as on the right side). But it's all just knitting. Begin with something simple and build your confidence. Soon you'll be knitting any lace pattern with ease.